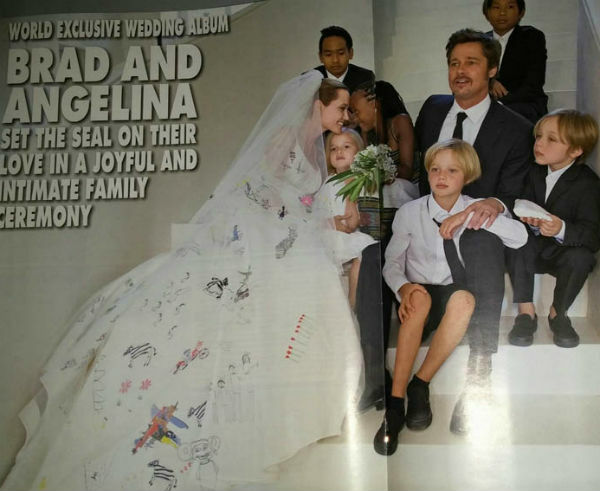 –Angelina Jolie and Brad Pitt reportedly scored $5 million for selling their wedding photos (which they’re donating to charity, natch). -Meanwhile, they’re on a boat. –Brad and his Fury costars sent a message of support for Prince Harry‘s Invictus Games . –Beyoncé celebrated her birthday by flipping off those divorce rumours and spending the day with Jay Z and Blue Ivy on a beach, while Jay Z posted a video tribute to her — just in case you weren’t already convinced. -Meanwhile, Blake Lively baked her a cake. So yeah, that happened. -It looks like Amal Alamuddin will be wearing an Alexander McQueen dress when she walks down the aisle. –Tywin Lannister just out-Coached Coach Taylor. -Wait, did we know Kristen Bell was pregnant? She showed off her belly bump at TIFF last night. –Sarah Paulson supports reproductive rights — and donut-eating and beer-chugging. -The cast of Parks and Rec went above and beyond for a Make a Wish kid. –Chris Pratt can make me a mix anytime. –Anna Kendrick‘s new musical just scored a distribution deal at TIFF. I’m seeing it Monday night — can’t wait! -Is there anyone in Hollywood who *won’t* be joining the Arrow cast this season? -The new Horrible Bosses 2 trailer proves the boys are way better at kidnapping than murder. Chris Pine doing comedy? I dig it.